No one, after lighting a lamp, puts it away in a cellar, nor under a peck-measure, but on the lampstand, in order that those who enter may see the light. The handyman brought along his girlfriend. He started working in the living room, and she went into the dining room to wait for him. I followed her a few minutes later to finish vacuuming up last night’s dinner crumbs, and there she was, standing motionless on the rug, staring into space. I started vacuuming. As I got close to her feet, I expected she’d notice and move out of the way. But no. She just stood there, unaware. I tried a few “move-in” gestures with the vacuum but got no response. The light was on, and she wasn’t blind (she’d easily found her way into the dining room). Neither was she deaf (when I finally asked her to move, she moved). Her senses were intact, but she didn’t use them. The events inside her head commanded her attention so completely that the world around her faded away into a dark unknown. Her behavior was extreme, but you shouldn’t consider it novel. We act similarly. Maybe not so vividly, but let’s not fool ourselves – we’re inattentive too. Jesus thinks inattentiveness is a bad idea. His lamp stories makethat clear. He routinely starts these stories with a joke about foolish uses for the genie-style lamps of the day. 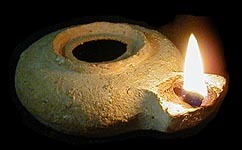 Every three year old in Galilee knew you don’t put a burning lamp under a bed unless you want to start a fire. You might need a lamp in the cellar, but you wouldn’t see much that was useful, just junk, dust, and cobwebs. No, Jesus explains, lamps belong on lamp-stands. That way they light the room, people walking in can see what’s there, and nobody ends up tripping over the furniture. Jesus ends His story with a warning, “If any man has ears to hear, let him hear.” God has made reality visible. We’re to pay attention to what He’s lit up. If we don’t, we’ll miss what God wants us to see, end up in the dark, and keep on tripping over life’s furniture. Though other factors may affect our ability to pay attention – blindness and deafness, brain dysfunction, substance abuse – part of every unawareness includes our preference for darkness rather than light. We are all selective about what we perceive; it’s a universal. Everybody, at least sometimes, tunes out. (We find the ideas inside out heads more compelling than the reality of our surroundings.) All tuning out contains an element of choice. And Jesus warns against this choice. He doesn’t want us to live in the dark, so unaware of reality that we keep tripping over life’s furniture. Our motives for tuning out run the gamut from indifference to terror. They differ from person to person and from occasion to occasion. It’s important to identify our motives, because we can’t turn away from something we haven’t named. Take time now to go through the following questions. They’ll give you some ideas about what lies behind the times you prefer darkness over light. Which of these reality blockers do you personally encounter? Are there other reality blockers you would add to my list? Let me know!